Our Northern German Style Pils is a Golden Lager brewed with Pilsner Malt, German Lager Yeast, Filtered Central Coast Water, and German Hops from three different regions. Pilsners originally began in Czechoslovakia but during the industrial revolution they were brewed in many parts of europe. In this way the style began to evolve into several sub styles; Czech Pilsner, Southern German Pils, Northern German Pils. The word Pils is used to differentiate the German versions from the Czech version. Typical Czech Pilsners are Budvar Bujeovice or Pilsner Urquell. Typical Northern German Pils’ are Warsteiner Premium Varum, EKU Pils, and Bitburger. This beer is brewed according to the German beer purity law of 1516 known as the Reinheitsgebot. Our Pils begins with a short snap of hop bitterness quickly giving way to a clean fresh breadlike malt backbone and it finishes with a classic european hoppy flavor with notes of herbs, pepper, and slight citrus. This beer is unfiltered yet at Night Lizard we followed the Reinheitsgebot so it is carbonated using a technique know as spunding. We then allowed to beer to lager for six weeks which not only created the clean dry flavor but it also allowed the beer to become crystal clear simply by allowing gravity to settle the yeast to the bottom of the lagering tank. 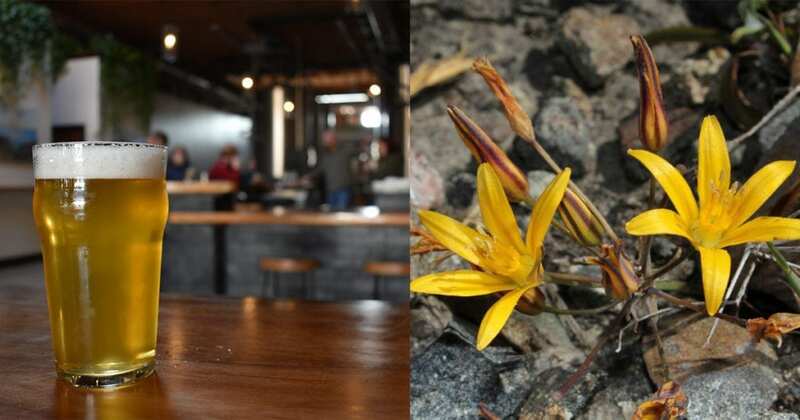 Our Goldenstar Pilsner is named after the Dwarf Goldenstar flower, endemic to San Luis Obispo County. Read more about this rare plant species, also known at bloomeria humilis, here.